The key to achieving the score you want to achieve on the GMAT isn’t pumping your head full of knowledge: it’s acquiring the right knowledge, and doing so in the right way. One of the most important aspects to your GMAT prep is practice questions. While there are a number of publishers out there that provides practice questions for the GMAT, the questions found in the Official GMAT Guide are the most authentic questions out there, and the best way to gauge how you’ll do on the actual test. 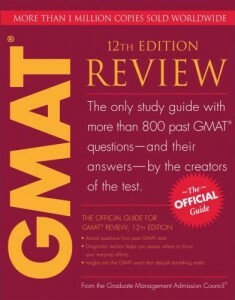 This book is the only source of actual GMAT questions you’ll find. Because it’s published by the Graduate Management Admissions Council – the actual organization that publishes the test – you can be sure it’s representative of what the actual test contains. This is a huge benefit, and greatly reduces speculation about what exactly it is you need to be studying. The Official GMAT Guide isn’t enough by itself to give you the practice and information you need to do well on the GMAT though. This is a collection of questions designed to give you some degree of familiarity with the questions on the GMAT, not a systematic study method. The Official GMAT Guide is one important component to your study strategy, but by itself it won’t help you do well on the test.